Hopkins Street is a north-south thoroughfare in South Buffalo. The road leads from South Park north towards the Buffalo River. Historically this area was a mix of commercial and industrial uses, connecting the steel mills to the adjacent South Buffalo neighborhoods. Hopkins Street is named for Brigadier General Timothy S. Hopkins, a War of 1812 general. Hopkins Road in Amherst is also named General Hopkins. The Hopkins family descended from Stephen Hopkins, who came over on the Mayflower. Oceanus Hopkins was born aboard the Mayflower. Most history books list Oceanus as a son; however, Hopkins family lore indicates that the family was bad at latin, she was a girl and should have been thus named Oceana. A second Stephen Hopkins signed the Declaration of Independence and Ichabod Hopkins signed the Constitution in Philadelphia on behalf of Massachusetts Ichabod Hopkins had a son, Timothy Soveral Hopkins. Timothy S. Hopkins was born in Massachusetts in 1776. He arrived in Clarence at the age of 22, arriving by foot. He then purchased land in 1804 from the Holland Land Company. Mr. Hopkins is said to have grown the first wheat on the Holland Purchase, on a farm in Clarence Hollow. When it was ready to be ground, he had to travel to Street’s mill at Chippewa, a village that became a part of the City of Niagara Falls, Ontario. This was a distance of 40 miles! The trip took four days and included a ferry ride from Black Rock, where only one family resided – the family of the ferry owner! Timothy married his wife Nancy Kerr in Williamsville; their marriage was the first recorded marriage in Erie County. They settled on Main Street on a farm in Snyder, near where Amherst Central High School is currently located. During the War of 1812, Mr. Hopkins rose through the rank to Brigadier General. He was an important part of the Battle Of Buffalo (also known as Battle of Black Rock), where he was stationed in Black Rock. Following the war, he resigned from his post. In 1819, he became the first Supervisor of the Town of Amherst and later served as Justice of the Peace. His reputation spread through the area, and he was elected Sheriff of Erie County. He was later elected to the New York State Assembly. 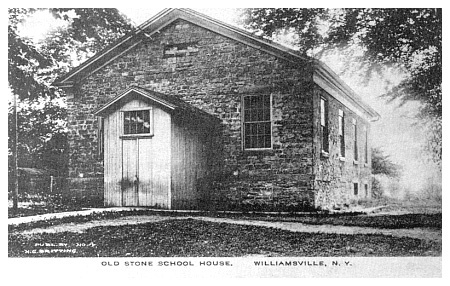 The Cayuga Street stone school-house in Williamsville was built by Timothy S. Hopkins in 1840 and still stands in Williamsville at 72 Cayuga. He died January 23, 1853. 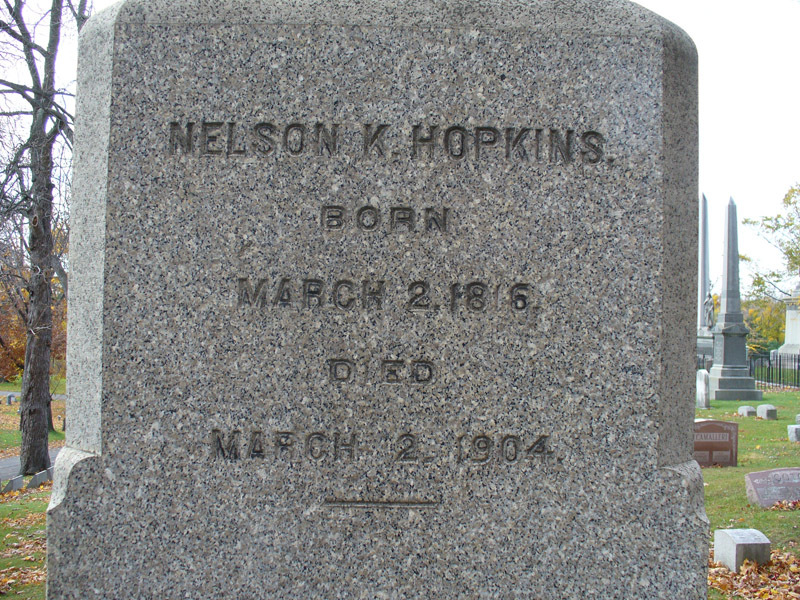 Nelson Kerr Hopkins, Timothy’s son, owned much of the land which included Hopkins Street. Nelson subdivided the land into building lots and named the street after his father. Nelson served as President of the Common Council of Buffalo and was New York State Comptroller from 1872 to 1875. Nelson also organized the City’s first paid fire department and served as fire commissioner for ten years. Nelson died in 1904 and is buried in Forest Lawn. Nelson’s brother, Timothy Augustus Hopkins owned the Eagle Hotel in Williamsville, which is now known as the Eagle House. He also operated a mill near the Eagle House, served as Justice of the Peace and Erie County Sheriff. Timothy A. Hopkins is responsible for building a bridge over the Erie Canal in the Tonawanda Creek area, and constructing drainage ditches in the northern part of Amherst to reclaim thousands of acres of land that were often covered by spring floods after a dam was placed near the mouth of Tonawanda Creek for canal purpose. Timothy A. Hopkins passed away in 1894 and is buried in Williamsville Cemetery. 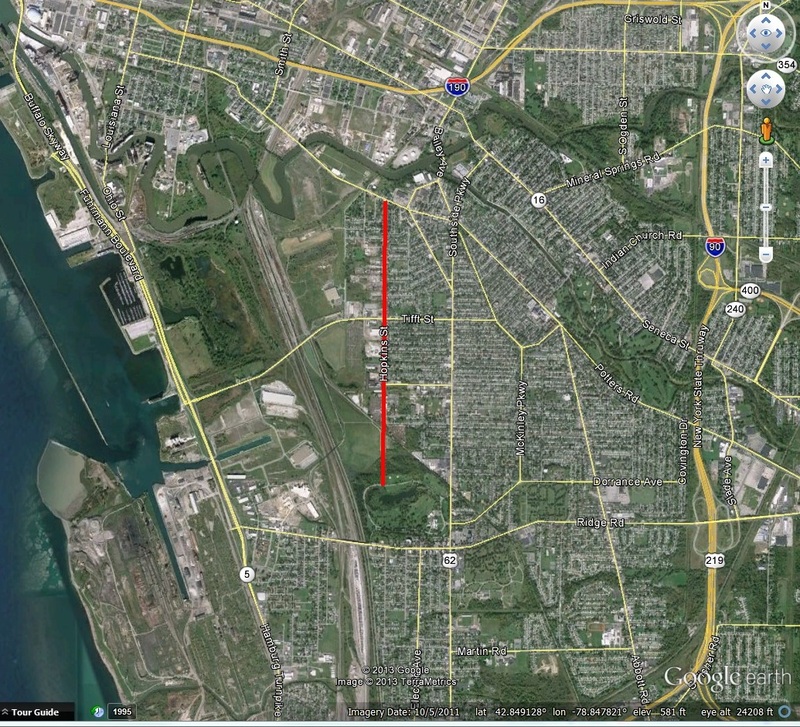 The Hopkins Street area is currently a part of the City of Buffalo South Buffalo Brownfield Opportunity Area (BOA). This study being done by New York State is working to revitalize the neighborhood by cleaning up vacant industrial sites and marketing properties for redevelopment. More information about the South Buffalo BOA can be found through Buffalo Urban Development Corporation. “Hopkins Street named for 1812 General” Courier Express. Oct 30 1939, sec 6 p 4. Larned, Josephus Nelson. The Progress of the Empire State: the History of Buffalo. Published by The Progress of the Empire State Company, New York: 1913. Smith, Henry Perry. History of the City of Buffalo and Erie County, Volume 1: 1620-1884. D. Mason & Co Publishers, Syracuse NY: 1884. Angela, I so enjoy reading your posts and look forward to the next. You are a gifted writer and I love your love of our city. Thank you. I am a Hopkins researcher and Timothy Scovil Hopkins does not descend from Stephen Hopkins of the Mayflower, but rather from John Hopkins who arrived later in Mass. and is first documented there in 1634. Shortly thereafter John moved to Rhode Island.